At the accredited Openlands, I work with dedicated women who advance the goals of land conservation in creative and inspiring ways, whether developing new community conservation programs or new approaches to land acquisitions in a heavily populated region. Additionally, Chris and I reached out to incredible women who work in conservation beyond the land trust world, such as those who connect faith communities to conservation or fight to protect Chicago's namesake river. I was raised by a single mother and widowed grandmother who instilled in me both a deep respect for the contributions and experiences of women and the love of nature that led me into conservation. The current issue's cover article, "Addressing Gender Bias in Conservation Organizations," was a great idea. No sector or movement is immune to society's long devaluing of women's work and ideas, but this article offers solutions for how land trusts can identify and hopefully overcome bias. 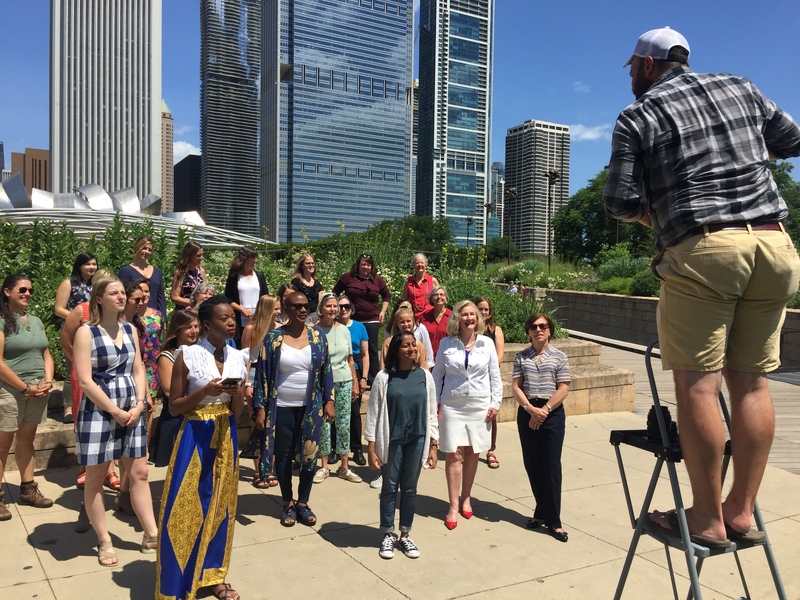 For the article's accompanying cover, nearly 30 women gathered in Lurie Garden (which was designed by a women-led firm) on a sun-drenched day in downtown Chicago's Millennium Park near the shores of Lake Michigan. Present were those whose careers spanned decades and those who were just beginning in the field. There were leaders of organizations, board members of land trusts, community organizers and state-wide advocates. People were delighted to be invited. Nancy Hopp, vice chair of the board of The Conservation Foundation wanted to come despite having a house full of relatives that week. She even brought her “grandgirls” to the shoot. So without further ado, here is the list of women who appear on the cover of the fall issue of Saving Land. Get out your issue and follow along! Brandon Hayes is director of communications at Openlands.